It’s November,we have moved back ashore and we're not fishing, so why am I posting this now? Because I found a well-wrapped package of my lox in the freezer on our last trip to the boat, when I cleaned out the fridge and freezer drawers. Here it is, two and a half months after it’s cure, and the lox is still moist and full of flavor. Just one taste and the lox brought back memories of summer cruising. It even helped to chase away the gloom of a damp Seattle day. One lazy afternoon at the Baranof Warm Springs dock, a potluck just happened, an impromptu happy hour/dinner . The dinner part was easy, we brought BBQ Salmon and a green salad with walnuts, green grapes and a honey vinaigrette dressing. Our happy hour contribution was a snap too, combining a freshly-baked baguette, a tangy cream cheese spread with “fixins” and a new batch of boat-cured lox. The assembled appetizers flew off the platter, and that’s always satisfying to a cook. The lox/cream cheese/ capers/ red onion/ dill combination, all layered atop thin slices of bread, has always been a hit with guests on board. No problems with leftovers, ever. We love salmon, just-caught wild salmon. Barbecued, smoked, baked with butter and garlic, pan sauteed... the list goes on. While we enjoy these preparations and more, I must say that salmon lox belongs in a favorites category all its own. Lox works for breakfast, lunch, appetizer, dinner or as a snack. Try lox in an omelet or frittata, as a base for Eggs Benedict, on a bagel or blini with cream cheese/red onion/capers, tossed in pasta or even topping a pizza. Okay, maybe not lox for dessert, but it is incredibly versatile. It’s also well-received as a hostess gift or take-home treat for guests. Is there one more reason to love lox? Oh yes, it is one easy solution to the too-much-salmon challenge… as long as there is ample refrigerator shelf space available for a multi-day cure. This means we can keep salmon fishing, because the lox disappears quickly. There are countless lox recipes available, ranging from the simple, few ingredient basic approach to lengthy, involved and fussy chef-linked directives. A YouTube search yielded 69 links to gravlax recipes, again ranging from ordinary folks to well-known chefs and TV luminaries. I favor the basic approach, and year by year have simplified both the ingredient list and the procedure. Why make it difficult? The results remain the same… very tasty. Combine the salt and sugar with just enough liquid to moisten, creating a very thick slurry. Put one of the salmon fillets on a large sheet of plastic wrap, skin side down. Mound half of the sugar/salt mixture on top of the salmon, being sure to cover it completely. Sprinkle liberally with fresh or dried dill. Repeat for the second piece of fish. Layer the fillets together, fleshy side to fleshy side (yes, that means skin side out). Wrap up the fish tightly in the plastic wrap. Put it in a deep glass or ceramic dish, just large enough to hold the fish. Put the fish in the refrigerator. Place a plate or board on top of the plastic-wrapped fish and weight it down. After 12 hours or so, turn the fish over. Continue to weight it down. You will see a lot of liquid inside the plastic wrap and leaking out into the dish... good, that means it's working. Ignore it unless it threatens to overflow the container. Depending on the thickness of the fillets, and your preference for the finished dryness/saltiness of the cure, it will take from 2 to 4 days to finish. Keep it refrigerated the entire time. Remove the plastic wrap and rinse off the brine. Dry the fish thoroughly. Use a very sharp knife to slice the fish on the bias, striving for the thinnest slices possible. Serve with whipped cream cheese, sour cream or crème fraiche, accompanied by capers , dill and thin slices of red onion. A Scandinavian lemon mustard sauce is another traditional presentation. 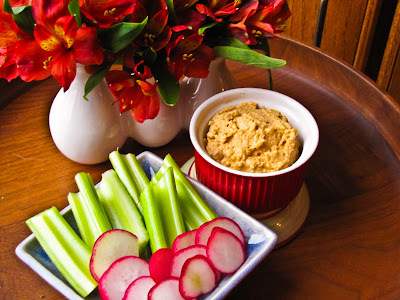 Serve with bagels, pumpernickel, French bread or sourdough slices. Yum! Tasting note: the lox was a hit today, topping thin slices of a new variation of my easy French bread. The latest loaf included the minced leaves of three 4-inch sprigs of fresh rosemary, and the scent and taste of this herb brightened the flavor of the bread. Even RL approved. 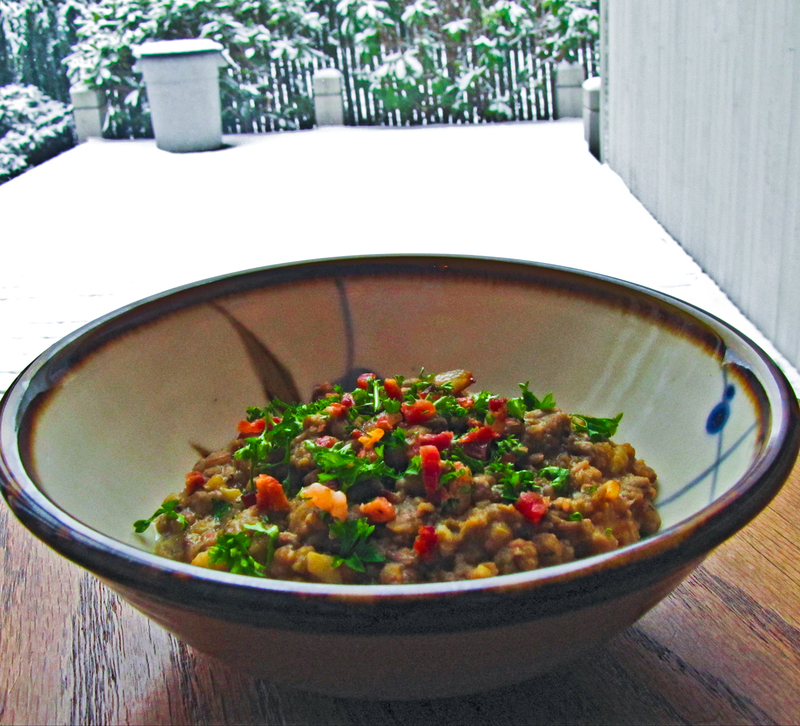 Not my best photo, but you get the idea - lentil soup is a filling comfort food on a snowy Seattle day. 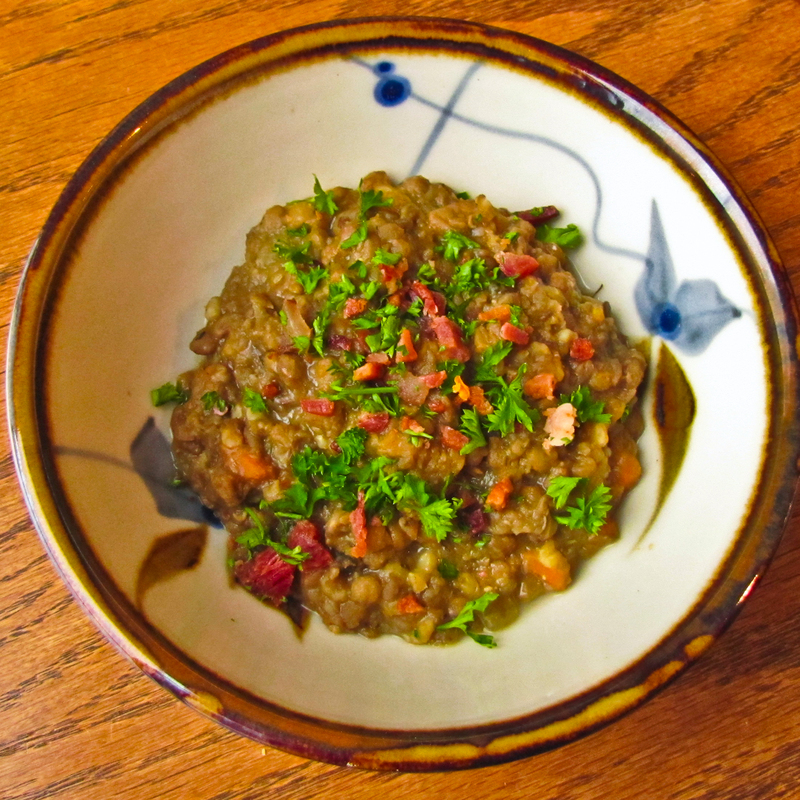 Lentils are not showy or beautiful, but these little legumes are a tasty, nutritional superfood. Did you know that lentils are packed with protein, cholesterol-lowering fiber, B vitamins, and about twice as much iron as other legumes? I didn't until I did a Google search and found this article, and this one, and several more. 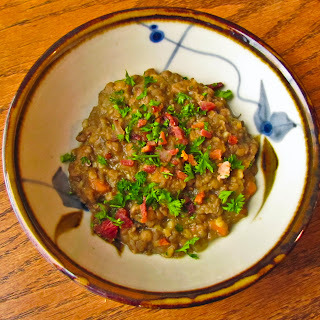 Nutrition aside, I love the way that lentils absorb the flavors of the cooking aromatics, the broth and the other ingredients. Of course the crunchy topping of bacon is an extra bonus. 1. Finely cube the bacon and saute in a soup pot over medium heat until crisp. Remove bacon with a slotted spoon and reserve. 2. Add onions, carrots, celery and garlic and saute in the bacon fat over low heat, covered, until tender and golden, about 25 minutes. 3. Add the chicken or beef stock, thyme, celery seeds, bay leaves, a grinding of fresh pepper (no salt until later) and the lentils. Bring to a boil, reduce heat, and cover. Simmer until lentils are very tender, about 40 minutes. 4. Discard bay leaves and puree half of the soup in a food processor, or use an immersion blender stick. Return pureed soup to the pot. 5. Taste and correct seasoning, adding salt if necessary. Stir in the reserved crisp bacon and simmer briefly before serving. Added chipotle chili powder and cumin in step 3. Added 1/8 cup rice to the soup after step 4, since soup was too loose and soupy. This worked well for immediate serving, but the soup needed additional broth when reheating a few days later. Hooray! I have been home for two weeks with my brand new knee and am ready for some cooking action... well, almost. Limited to two trips per day downstairs, and walking with one crutch, I'm not exactly flying around the kitchen. 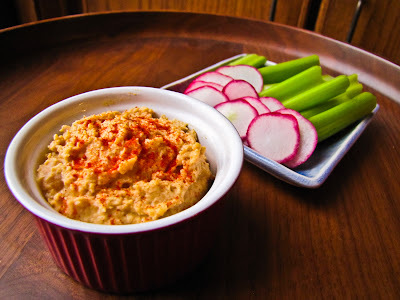 RL calls himself The Butler and has been doing super work as Chief Cook, but today I couldn't resist whipping up a batch of hummus, one of our favorite snacks. 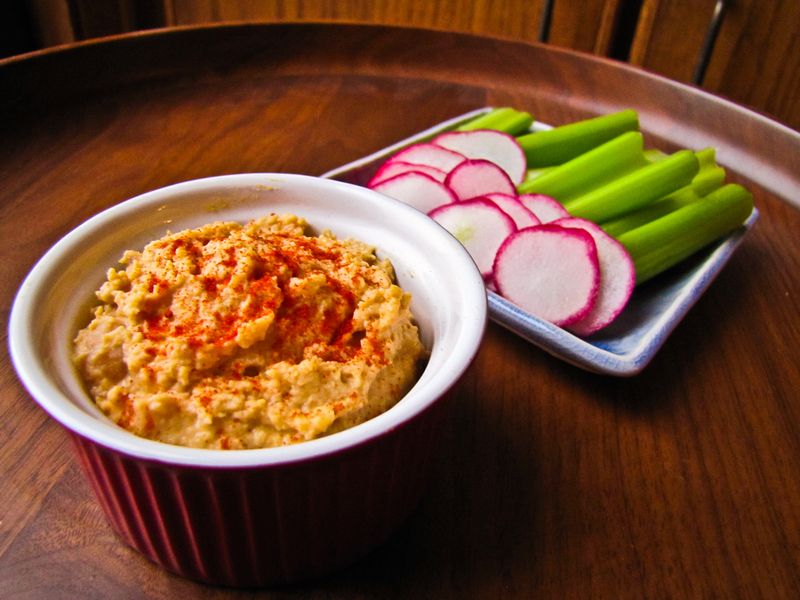 Hummus is a tasty dip for veggies, a heavenly spread for toasted pita bread wedges, and a terrific addition to a sandwich of grilled vegetables. I'll even confess to enjoying it straight off the spoon. It's not a low calorie item, but you can still feel virtuous nibbling on all of the accompanying vegetables. 1. Heat the chickpeas in their canned juices. Bring to a boil and let them cool to room temperature. Drain the chickpeas, reserving the cooking liquid. 2. Use a blender or food processor to puree the chickpeas, minced garlic, tahini paste, 1/3 cup lemon juice and about 1/4 cup of the cooking liquid. Aim for a medium-thick spread, adding more or less liquid as required. 3. Stir in the paprika and cumin and add salt and white pepper to taste (optional). 4. To serve, drizzle lightly with olive oil and sprinkle with additional paprika and/or ground cumin, maybe even some chopped Italian parsley. Present with raw vegetables (celery, carrots, radish slices, red pepper strips, etc.) and/or pita wedges for dipping. Serves 4 as a first course. To double the quantity, make two separate batches if using a blender. 2. Split the pita rounds in half, separating top from bottom. Spray the bumpy inside surfaces generously with the cooking spray, or brush lightly with olive oil. Sprinkle each round with your seasoning of choice, or salt. Slice each pita half into 6 or 8 wedges. 3. Lay out the pita wedges on a cookie sheet, oiled/flavored sides up. Bake at 425 degrees for approximately 12 minutes, or until they just begin to brown. 4. Enjoy as a stand-alone appetizer or as a scoop for the hummus. This fish platter from the galley has absolutely nothing to do with with my blogging absence for the next week or two, but it makes me smile. 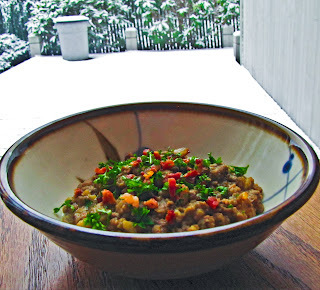 I have been busy in the kitchen recently, working on a number of cook-to-freeze items. I'll post some photos and recipes as we enjoy each dish, and maybe coax RL into sharing a comment or two as he as he shifts roles from diner to cook.